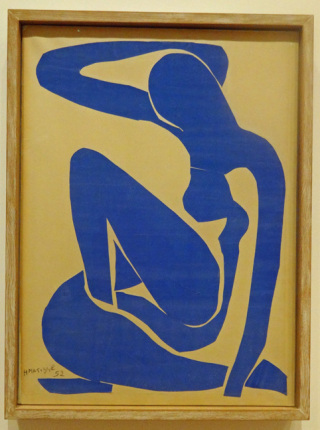 Matisse pieced together this iconic figure from disjointed pieces of blue painted paper. The paper cutouts, allowed the artist “to draw in paper,” or “paint with scissors.” as he described it. This series, which he created after his illness, freed him up to simplify form and combine painting and drawing. During his final years, when illness left him bedridden, the cutouts became his only means of expression, but far from diminishing his creativity he succeeded in creating a new visual language. His cut-outs graced the covers of Verve magazine, and a few years later published Jazz, a limited edition book containing prints of his collages accompanied by his written thoughts.